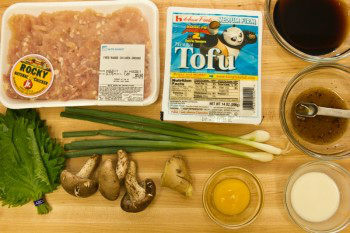 Here is a very quick and healthy chicken tofu steak which we use ground chicken and tofu to make the patties. In Japan this dish is called Tofu Hambagu, however my husband pointed out that people may misunderstand it as “vegetarian” dish, so I changed the name since it contains ground chicken. If you are not a big tofu fan, you might be surprised that you won’t probably noticed the use of tofu here. It’s healthier and much more economical than just chicken only. 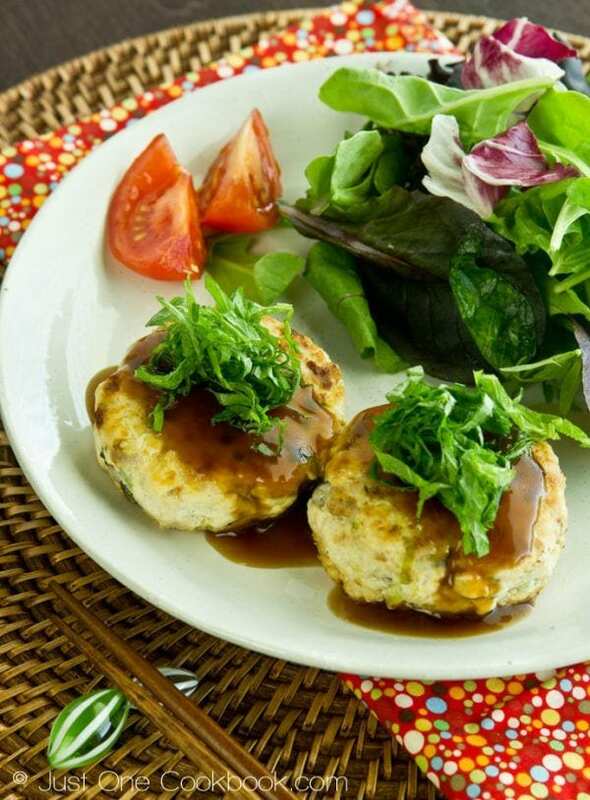 Despite being a low calorie healthy dish, the meat patties are juicy and have great flavor. Pour soy sauce base glaze on top right before you serve. I served the chicken burger steak with salad, rice, and miso soup – very light and healthy dinner. Last but not least, I want to thank Alyssa of Mom De Cuisine for passing me the blog award! Thank you Alyssa! Japanese chicken tofu steak, chicken burger made from tofu, ground chicken, and shiitake mushroom with a tasty soy glaze. Drain the tofu for 15 minutes like below. We just need 2/3 of tofu so keep the 1/3 in an air tight container filled with water. It can be kept in the fridge for a few days or you can use the remaining tofu to make tofu miso soup. Meanwhile, cut Negi, Shiitake mushrooms, and ginger and put them in a large bowl. Add tofu and egg yolk and mix all together using hands. Add Seasonings and continue to mix with hands. Pinch off 2 inch from the mixture and make meatballs. Toss each ball from one hand to the other hand repeatedly about 5 times in order to release the from air inside the balls. Burger steaks will crack while cooking if the air inside is not released. 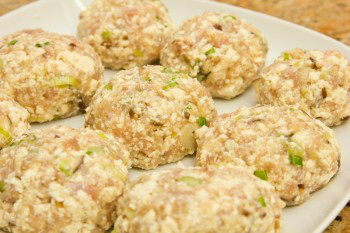 Then make oval shape patties (see a picture below). The top shouldn’t be completely flat (a bit more round). The tofu will release water if you wait, so start cooking the patties soon. In a non-stick frying pan, heat oil over medium heat. Put the patties on one by one. Cook the patties for about 5 minutes on one side. Do not turn over until browned. After you turn over, lower heat to medium low and cook for 10 minutes. Transfer to a plate. Repeat the process for the 2nd batch if you couldn’t fit all the meat patties in the frying pan. After you are done with cooking the patties, go to the next step. In a smaller frying pan, bring Sauce Seasonings to a boil. Then stir in corn starch mix. Make sure corn starch mix is dissolved completely. When the sauce gets thicken, pour the sauce over the steak. This burger must be very moist with added tofu, i must try in a quick lunch one day. Thanks for sharing Nami. These look so good! A great alternative to hamburgers – healthier and more economical! I am bookmarking this to try. And your photos are gorgeous! I’ve been wanting to make these! I think it’s about time 🙂 Looks delicious! Adding tofu to ground meat is something I do very often: it always makes the patties/balls softer (especially when made with very lean meat). The presence of shiitake is very surprising. I can imagine how interesting and complex they must make these patties. Changing the name was a wise and creative decision! I have the world’s BIGGEST tofu fan and would eat it without being asked 🙂 Why don’t more people use it? Especially in burgers, yum! (or in ma pao tofu, yum!!) Great burger too, much different to the American ones despite it still being called a ‘burger’! I’ve been wanting to use more tofu, this is great! I think my kids would really love this one. Thanks for sharing! These look beautiful and I love the look of that glaze, I could put that on anything. I like the idea of adding the tofu to the chicken. As usual very nice photos. Nami these look so good. What a great alternative to a regular burger. We dont eat a lot of red meat in our house so this is wonderful! Great idea to combine tofu and chicken! These burgers look so tasty! Yum this is one of my favorites to make at home, sometimes I do tofu with canned salmon or tuna too. 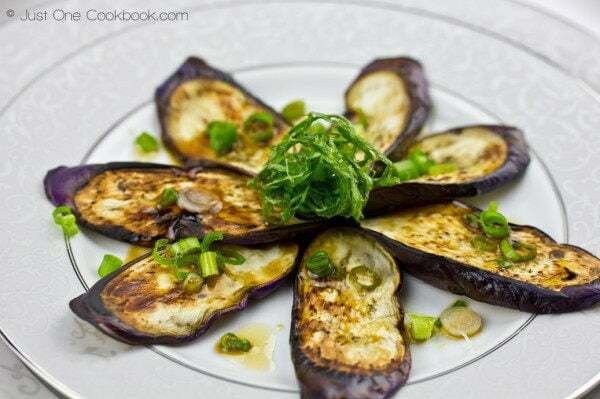 Yours looks so fancy with the glaze and shiso garnish, I normally just eat with soy sauce. =) Great job Nami! Chicken and tofu, two of my favorite things in the world to eat! I saw the photo and thought the sauce on top was ponzu, my mouth started to water right away… You know I have been making a lazy person’s sandwich by using 2 slices of toasts, a few slices of turkey, mayo, ponzu sauce and fried onions. So yum! Great recipe Nami. I don’t use tofu much but think I should give it a try after seeing this. Way healthier than beef, and I love a good chicken burger. I’m sending this recipe to a couple of my children that I know will love this too. Thanks a bunch Nami! I never thought to mix tofu with meat to make patties! YUM! WOW! What a healthy tofu burger 🙂 I was looking at the magazine two days ago and I saw a tofu burger recipe but yours definitely looks better. Looks so yummy! This looks AMAZING! I’ve mixed tofu with ground pork and hubby had NO idea. Believe it or not, he’s actually requested that I made a tofu dish for him….go figure! I have never cooked with tofu before. I love chicken burgers though, so this is a great way to stretch it. They sound wonderful! I love tofu all the time combined with chicken in soups & salads.You idea of making patties out of them is superb & healthy Nami. And what a beautifully arranged plate my friend!My husband LOVES ground chicken ..he is into kebabs all the time, these patties with tofu will please him certainly. Tofu will make these super moist and creamy..I m making this soon for him..thanks for sharing! What a great coincidence! I’ve just made a tofu dish as well! You know I love tofu and we always eat them fried crispy. I like the idea of adding them to the meat to make patties. Your chopstick holders are cute! What a fantastic looking meal Nami – as you know, I am not a big tofu fan, so this is a perfect way for me to make use of it. These look so good, Nami! 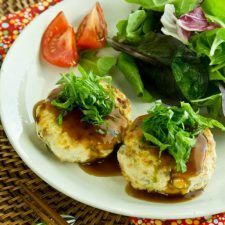 I make Hamburg Steak w/tofu, but never thought about using it with ground chicken! What a great idea!! I like that you add the shiitake mushrooms to add extra meatiness. You always make the best stuff 🙂 Again, your photos are beautiful, I love the colors!! This sounds delicious, what a great combination and I bet the texture is just perfect. I absolutely love your flavors, Nami! I’ll be trying this one! I sure the tofu must have made this burger soft and silky in texture…. Yummmm… Such a healthy dish. i love the idea of combining tofu and chicken. I would imagine it makes it taste lighter. Happy Wednesday! I would have never thought of that! I am sure that the hamburger steak is more tender and juicy combined with the tofu and yes, it really is more economical. I am especially intrigued with the seasoning as it is so new to me to flavour meatballs that way. Healthy and delicious looks like an impossible combination but you made it possible through this post. I know of a similar recipe which is called Mushroom burger,usually its made out of entirely mushrooms but being me I added a small amount of beef on it, it will be posted soon. As always your food looks amazing! Im trying this one next. Mmmmm yummmm! I love chicken burgers, but these sound even better! They look so moist and I love that dressing! Very healthy (yet delicious) dinner!! Bookmarked! These look so good and I know I’d love these for dinner with all of those delicious flavors! I like that it combines tofu and chicken and that sauce on top is just perfect. I must try!! this looks amazing and my kid will love it. this is going to become a regular on our menu! Tofu with chicken is a brilliant combo and love the way you make it ! I can honestly say I have never tried tofu in my life. Maybe because it has such a negative image? However, if there was a recipe I would try it in, I think it may be this one! Nami, we should eat more of this burger than the red meat. More healthy. Looking good! These are mighty delicious looking burgers. Never would I thought that they are made with tofu..very beautiful presentation, and photos…Have a wonderful day Nami!!! Nami! This looks delicious. I’ll have to try this with the boys this weekend. They’re going to love it. I’m so glad you came by my site so I could come visit you here. I know I’m going to love all your stuff! I’ll let you know how I do with your eggplant/ponzu recipe. It’s on the menu for next week! What a gorgeous meal! That sauce looks out of this world. I’m not a huge tofu fan, but if it’s mixed with chicken I think there’s a much better chance of me liking it! Delicious looking meal! I bought 3 boxes of firm tofu from costco. I generally breakfast scramble and I don’t like stir fried tofu. I think I will use the remaining to make your burgers. Oh nami, they look so gorgeous. The entire plate is inviting,loving the fresh salad too! Love the combination of ground chicken and tofu. You take such beautiful photos! These look really delicious and healthy! I must say I have not bought ready made burger patties since I started learning how to cook because making your own is not difficult and you know exactly what is in the burger patties! Wow! I have never been a fan of tofu, but I have never thought to mix it with another protein. This recipe sounds great and like a great opportunity for my to test out tofu in my house again! Anyway I love Japanese style burgers and yours look delicious! You know, I have not made homemade burger patties for such a long time! Love chicken and tofu burgers. 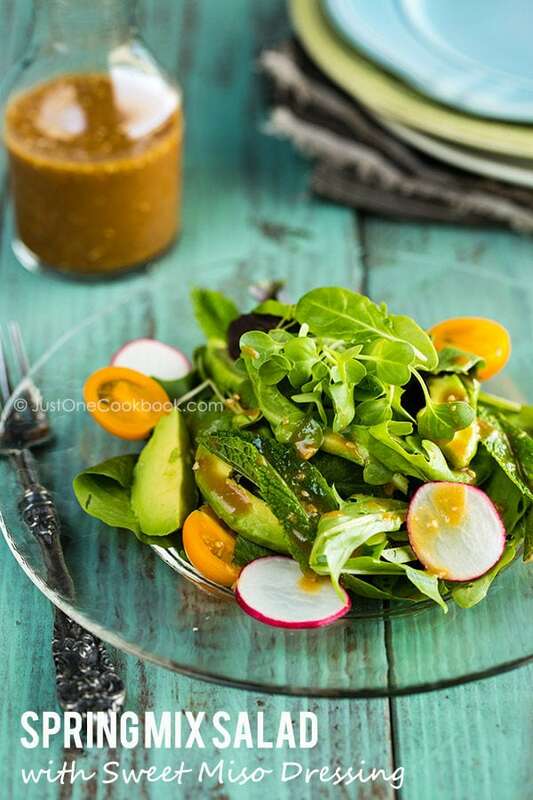 Your pictures make it look very filling and delicious, with lots of nutritious ingredients. Love it! Sure to be a hit with the whole family too, since kids love burgers! 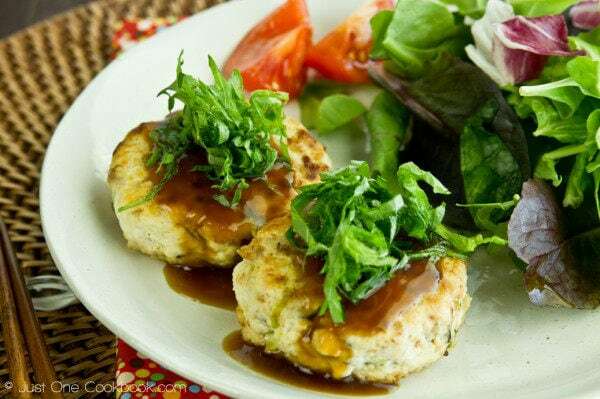 Love tofu in meat patties, it makes it really moist and tender! How did I miss this awesome recipe? I LOVE it! I have to try swapping out breadcrumbs and parmesan for tofu, it seems like the perfect way of getting a juicy burger, without the added calories! I really must try this recipe!! i am in love with it already:) thank you for sharing this. I used turkey in these as well. Big hit. 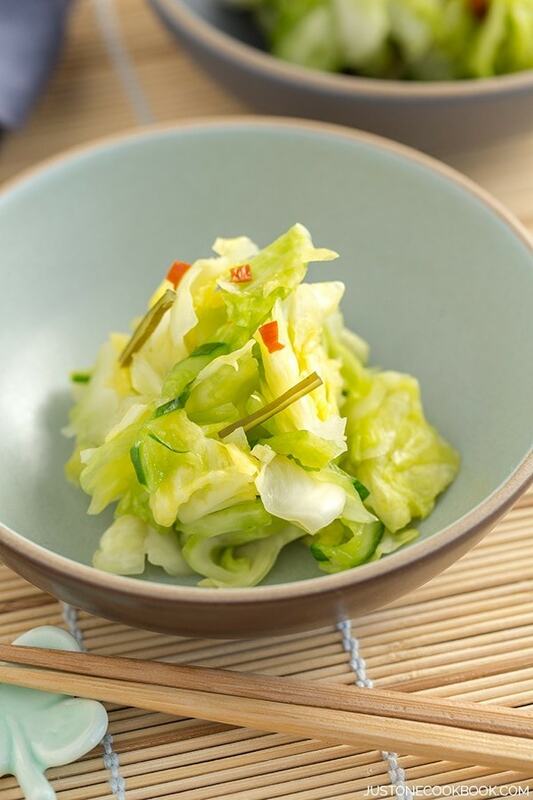 IS there a subsitute for Konbucha, that I can put in this recipe? or can I leave Konbucha out? konichiwa! i just recently discovered your site and was intrigued by this recipe… combining ground chicken and tofu was a great idea…tried it out last night with my own little twists and they turned out so tender and light….i’ll be making this again, for sure. by the way, i think a really great alternative to konbucha, is powdered dashi–i even managed to find a brand that didn’t contain any msg. anyways, arigato for the inspiration! Hi Nami, I’m a new fan of yours 🙂 I just cooked this this morning and my wife and toddler really enjoyed it! I think it speaks alot to your taste in ingredients that I actually made several mistakes in preparing it, but it still turns out delicious anyway. Thank you for this great website! Hi Andi! Thank you so much for trying this recipe and writing your feedback! I’m glad to hear your family enjoyed it. Hey! I’ve just finished making this dish! PERRRFECT!! I hate regular tofu, but you know? I don’t mind it at all here! 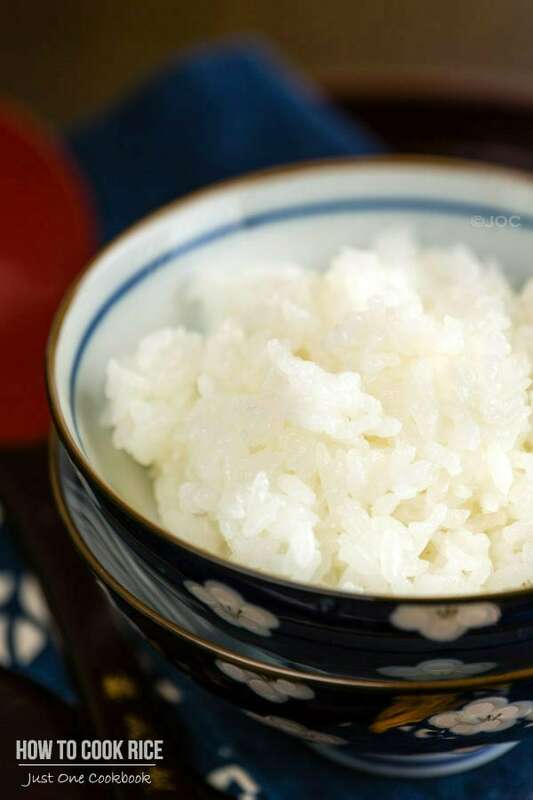 a little bit variation that I made : I added a little bit more sugar, and omit all the sake and mirin (I don’t have it here in Indonesia :(), and substitute it with salty soy sauce and pepper, and a little bit of worchestire sauce. oh, and I don’t use a different pan, I use the pan that still have the used-oil-and-goodness from the hambaagu. it tastes just like steak sauce, so yummy!!! Thank you very much for this idea, I love it I love it I love it!!! Hi Nami, I’ve just found out your blog a few days ago and I already tried one recipe(honey soy sauce chicken). It was awesome! and i think i want to try a lot more. but i have some questions for you. Since I live in SF too, just wondering where can you get Shiso leaves and ground chicken in the city? I didn’t try to look for Shiso yet but i can’t find ground chicken anywhere. Another question is can i use the zaru soba dipping sauce for tempura dipping sauce or tempura dipping sauce for zaru soba dipping sauce? becauce the japanese restaurant i work at, they use the same sauce for zaru and tempura. Anyway, thanks for all delicious recipes. I’m your big fan now :)..
Hi Jik! I’m glad you liked the honey soy sauce chicken recipe! 🙂 You can get shiso leaves in any Japanese market. In SF, Nijiya in Japan town sells shiso leaves. I also heard that Korean supermarkets sell shiso too. In Japanese market, I think it’s around $1.20 for 10 shiso leaves. 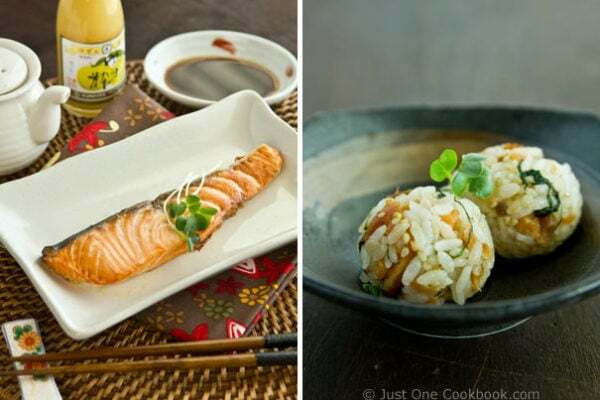 About zaru soba dipping sauce and tempura sauce, you can use the same sauce, but usually dipping sauce is stronger and tempura sauce is more diluted. 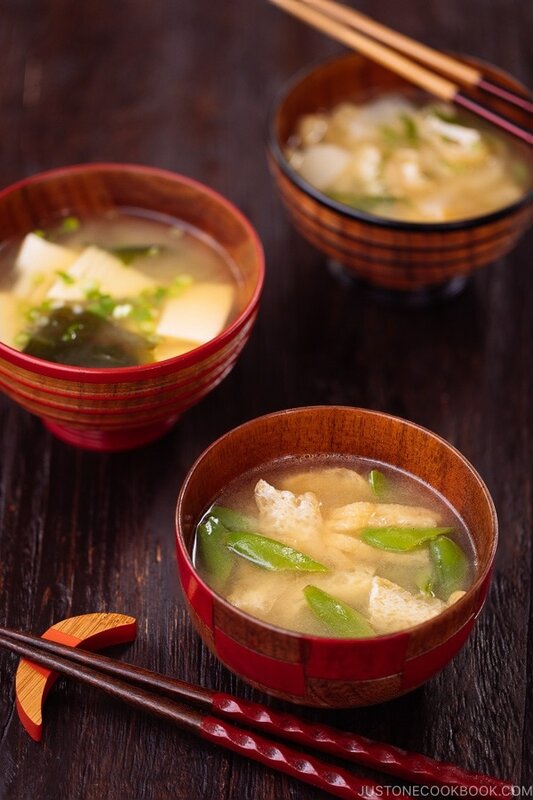 Warm noodle soup is more diluted than dipping sauce, and noodle soup is close to tempura dipping sauce. Hi Nami, i tried out this dish tonight as i am on a diet program so trying all your healthy dish. I followed your ingredients as per stated above, i do not have Konbucha so i substituted it with salt instead in both the Seasoning & the Sauce. However, both the meat and sauce turned out to be on the salty side. Is this dish suppose to be relatively salty in taste? Or should i add in some sugar or mirin at some point? Hi Jackie! Thank you so much for your feedback. After I read your message, I rechecked my original recipe. 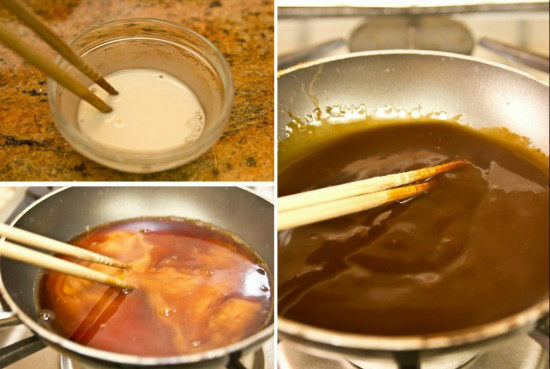 Mirin should be included in the sauce because I usually make this sauce with sake + soy sauce + mirin/sugar (each recipe I change the portion around but these three is usually the key). I’m so sorry you had to try the sauce without sweetness. I apologize for my mistake and I’ll be more careful when I type the recipe. Again, thank you so much for notifying me and I’m so sorry about the salty sauce! No worries about the saltiness. I will try again with the updated recipe. Your recipes are always easy for beginners like me and always turn out yummy! Looking forward to more recipes from your posting. This is a great and healthy alternative to beef burgers. I really love that the chicken and tofu burger is so light and fluffy. They even heat well and taste even better the next day. Thanks.